We have organized, catalogued, and prepared the Nehemiah Lending Library. Over 500 books are waiting to be checked out by YOU! Come and browse, find the book you want to read and return it when you are done. There is a card in front of each book identifying the book that is available for lending. You as the borrower just need to fill out your name and mark the date and place the card in the card holder on the shelf. Then when you return the book you only have to place the book in the aqua box on the floor. We will return it to it's rightful place on the shelf. 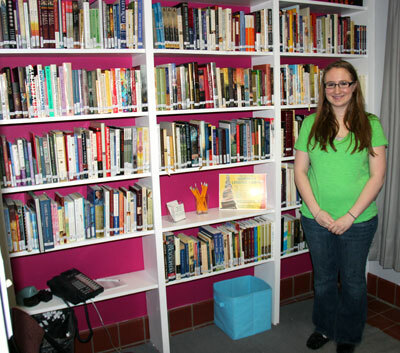 A special thank you to Lake Country Lutheran High School student Emily Sternemann who spend countless hours organizing and cataloging the Nehemiah Lending Library for Divine Redeemer's use. 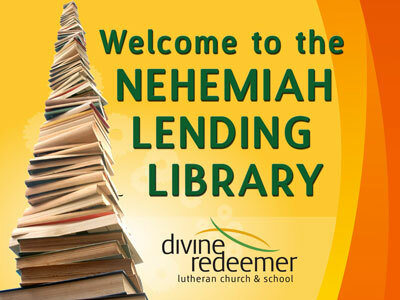 The Nehemiah Lending Library is located off of the narthex in the room by the exit. We hope you will visit soon and often. *Unfortunately our shelves are full and we cannot accept anymore donations.